(Viceroy Butterfly (Limenitis archippus) - 01) Mary spotted this viceroy butterfly resting in the grass while we were on one of our walks. It was slowly opening and closing its wings. 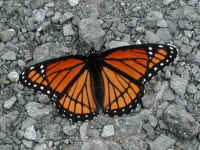 The viceroy butterfly looks similar to the monarch, except that the viceroy has a thin black line running across its rear wings somewhat parallel to the outer black border. 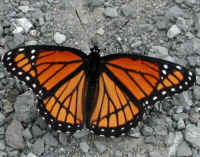 The outer black border of the viceroy also has a single white dot in each "segment" of both wings. (Viceroy Butterfly (Limenitis archippus) - 02) The caterpillar stage of the viceroy butterfly can most often be found on trees of the willow family, such as willows, poplars and cottonwoods. The male viceroy can also be seen during the day flying around these host trees looking for a female viceroy butterfly or perched on other vegetation. 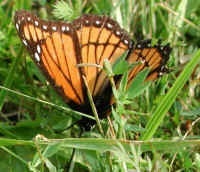 The female viceroy butterfly lays her eggs at the tip of the host tree leaves, but only two or three eggs are laid by her before she moves on to another tree. This is obviously a way of insuring that a maximum number of her offspring will survive. This requires a degree of intelligence that we humans all too often fail to accept exists in other creatures. (Viceroy Butterfly (Limenitis archippus) - 03) While we were taking these pictures, this viceroy butterfly would occasionally move around. It may have been feeding on something, but we could not determine that. Viceroy butterflies most often feed on flowers, but when they are not readily available they will feed on aphid honeydew, decaying fungi, and even carrion and dung. (Viceroy Butterfly (Limenitis archippus) - 04) In this photo we can also see the inner black band with two large white dots and one very small one beginning from the leading edge of the front wings with one dot in each of the first three "segments", with a trailing thin black line ending in the outer black band. 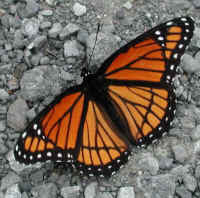 The wing span of the viceroy butterfly can vary from 2-1/2 to 3-3/8 inches. The one pictured here appeared to be on the smaller side. This viceroy appears to have sustained an injury to the outer edge of the left rear wing. (Viceroy Butterfly (Limenitis archippus) - 05) As we were taking one of our frequent walks, we saw this viceroy butterfly resting on the side of the road. (Viceroy Butterfly (Limenitis archippus) - 06) This is another look at the viceroy butterfly resting on the side of the road. (Viceroy Butterfly (Limenitis archippus) - 07) This is the last photo we took of the viceroy on the side of the road.